Labdhi was my younger brother. I am the eldest amongst five brothers and two sisters and he was the next. We both were born from the first marriage of our father and had lost our mother at a very young age. I was just 3 and Labdhi was less than a year old at that time. Rest of our siblings were born from our step-mother whom our father married soon after the death of our real mother. We also had in our family our elderly aunt, the wife of my father’s late elder brother. We all called her “Baiji”. She was elder to my father and had lost her husband just a few months after her marriage. As she didn’t have any children of her own, she took special care of Labdhi and me. She was the eldest person in our family and commanded respect from everyone. In fact, she eventually stayed in Jodhpur and on her own looked after and supervised the college education of all of us siblings as well as of about an equal number of children (3 boys and 4 girls) of my father’s younger sister. My father was fully dedicated to providing the best possible education to all of his children and provided adequate financial resources to take care of that. Financial support from our father and unselfish dedication, sacrifice, and hardwork on part of Baiji finally resulted in one of the most educated and close-knit families in our community in this part of the country. It has been more than five decades now and it is difficult to remember any of the specific events of our early childhood. But, one thing I do remember is that Labdhi did not eat his food properly during his childhood years. He would try to hide parts of what was on his plate to give an impression that he had already consumed it. Baiji had to sit next to him during meal times to make sure he ate properly. Another thing I remember about Labdhi was that he was an introvert. He rarely went out to play with friends in the neighbourhood although that was the normal thing to do for most of the boys of his age in those days. There were no television in fifties and sixties in India and thus the only entertainment for kids was to play together in groups. However, he mostly stayed at home. He was a very quiet and simple boy who never picked any fights or quarrels with anybody and there were no complaints from any quarters about him either. I think he would always listen carefully and apparently tried to comprehend things in his own mind. But he rarely spoke much in those days. Thus, he had a rather quiet and uneventful childhood as far as I can remember. He was already quite thoughtful, reflective, and humane in those early days of his life. BS Bhandari and LRB, School Days, Sojat, 1959-60. We would visit Mandoli (a pilgrimage) every few months. I also remember our trips together to Mount Abu (a Hill station) in the summers and trips to Jodhpur, Jaipur, Udaipur, Hyderabad, Bombay, and Jaisalmer during the early childhood. Our father also took us frequently to picnics at the Sardar Samand Palace which used to be a royal (Jodhpur Maharaja) hunting retreat and was about 40 kms from Sojat. Our father was the legal counsel looking after the royal properties in that area and thus had free access to the Palace there. I also used to visit Khimel(Rani), my nanihal, during my summer holidays but Labdhi rarely joined me there. He would usually stay back with Baiji at Sojat. He remained reserved even on the Holi and Diwali functions. It was just his nature in those days. I think it was only in the upper classes of the Higher Secondary School that Labdhi began participating in debates and other literary activities in school and started becoming more social. We studied at a Government Higher Secondary School in Sojat, a tehsil headquarter in Pali district of Rajasthan, India. It was a Hindi medium school with none of the frills associated with the better known english medium public schools in India of the time. However, it was much closer to the national realities as boys from all socio-economic segments of the society attended it. Those were also the days of great national pride and patriotism as India had just become independent in 1947 and there were talks of development all around. The government wanted to train a lot of engineers, doctors, scientists, and other professionals and there were lots of new jobs becoming available for educated people. Our father was an Advocate (Lawyer), a member of the Bar Council at Rajasthan High Court. He was settled in Sojat and thus practiced Law mostly at the Tehsil Courts in Sojat and at District Courts in Pali. He was one of the leading lawyers in Pali district and thus had a good practice, name, and fame. He was also involved in the Indian Freedom Movement and was thus well respected in the society there. He was also involved in a lot of social and political activities. I still remember the day during my childhood when the then Chief Minister of our state, Shri Mohan Lal Sukhadia, came with his entourage for dinner at our home. Later we had many prominent personalities of those times such as Shri Mathura Das Mathur, Shri Bhairon Singh Shekhawat, Shri L M Singhvi, and Shri Gumanmal Lodha, etc visiting us from time to time. Such interaction was an advantage with which we grew up. We were always made to feel special and were thus motivated enough to excel in our academics as well as in other activities to be able to lead. Our father also had strong literary interests. He used to write Hindi poetry and had formed a group to promote such activities in the town. I still remember our Hindi teacher at school as a frequent visitor to our home in connection with these activities. This had profound influence on me as well as on Labdhi. I began writing short stories etc in Hindi at a very early age and even got published in papers/magazines while still in school. We both also became active with debate competitions and with other literary activities at school and represented our school at District level events. Living in Sojat, we obviously had a semi-rural upbringing. This had its advantages as well as disadvantages: the main advantage being that we could see the society at a greater depth and in its real form particularly in the rural areas. Our father had a lot of farmers as his clients and we used to visit their farms occasionally at the time of the harvesting of new crops to enjoy, for example, the corn-on-the-cob and fresh green wheat baked in open-fire in a field. That gave us a first-hand deeper feeling of the rural society which you could never acquire from a good public school education in urban areas. The school we attended was a Multi-Purpose Higher Secondary School in those days. We had to even learn Weaving and Tailoring there as part of our course work. 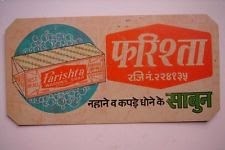 That came very handy when we lived alone in hostels/dorms later in India and abroad. The main disadvantage was of course the lack of opportunity to learn and speak fluent English. There was also no electricity in Sojat until 1960, and I passed my Higher Secondary Examinations studying with kerosene lamps. Labdhi was lucky to have access to electricity during the last two years (1960-62) of his schooling at Sojat. At that time, radio was the only source of entertainment for us. There were just two broadcasts : 1)’Radio Ceylon’ where we listened to musical programs and songs, and 2)‘Aakashvani’ where we listened to daily news and speeches from the national leaders. BS Bhandari, LRB and other friends from the neighbourhood, Sojat, 1957-58. Labdhi was a little less than three years younger to me and was just two grades behind me in school. We both had been tutored at home and begun school directly in a higher grade: me in 4th grade, and Labdhi also in 4th grade two years later. 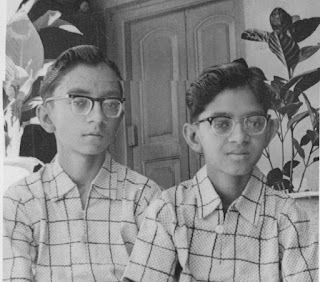 I finished my Higher Secondary School in Science stream and moved to Jaswant college at Jodhpur in July 1960. Labdhi was in 10th grade at that time in Arts stream. During the next two years in school, he actively participated in several literary activities and became more social. Amongst his friends from school at Sojat, I remember Sushil Bhandari (a practicing C.A. in Bombay), Sampat Singhvi (a successful pharmacist in USA), Suparas Bhandari (former Director of Oriental Insurance Co., and Founder-Chairman of the Agricultural Insurance Company of the Govt of India, now retired), and Bhanwar Lal Kumhar who continued with him during their B.A. program at Jodhpur and then joined RJS or RAS services of Govt. of Rajasthan. Labdhi came to Jodhpur in 1962 to join the newly formed University of Jodhpur for his B.A. program. I had lived in a hostel during the years 1960-62 in Jodhpur but me and Labdhi both lived with Shri Subh Rajsa Dhariwal and his family during the academic year 1962-63. Shri Subh Rajsa Dhariwal was the younger brother of Baiji and lived in Manak Chowk in Jodhpur at that time. 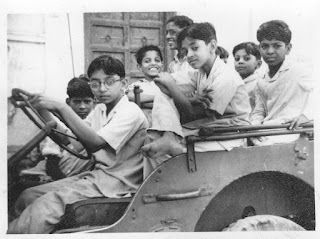 In July 1963, our family rented a house in Mohanpura, close to the college campus, and we moved there. This is where all our siblings and relatives lived and got their college education under the supervision of Baiji. I finished my B.Sc. and joined the first batch of M.Sc. in Physics at the University of Jodhpur in July 1963. During the three years in college(1962-65), there was a distinct change in Labdhi’s personality; though still thin, tall, and with a frail-looking physique, he became much more of an extrovert and had good friends with similar tastes and interests. I remember Brij Mohan Jindal(retired as Chief Commissioner of Income Tax, Govt of India), Jitendra Singhi (a practicing lawyer at Rajasthan High Court Bench in Jaipur), and Deepali Chatterjee in particular. They would socialize often and also have contacts with visiting foreign students etc as they all spoke some english. 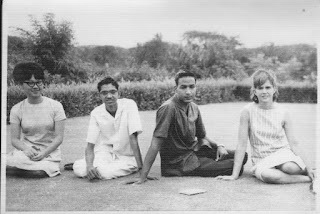 LRB & Brij Mohan Jindal with visiting foreign students, College days, Jodhpur, 1964-65. During the final year Labdhi and Brij Mohan both tried and got admission in IIMA for the MBA program. So Labdhi moved to Ahmedabad in 1965 and I became a Lecturer in Physics at the University of Jodhpur after topping my M.Sc. examinations that year. Labdhi and Brij Mohan Jindal both joined IIMA for their MBA programs. 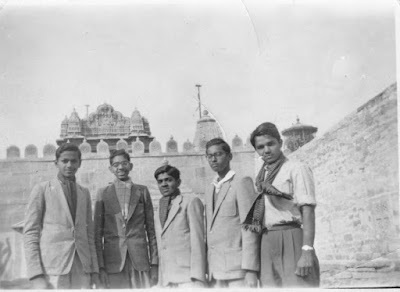 Our father accompanied Labdhi to Ahmedabad at the time of first joining the institute as Labdhi had never lived alone and the family was worried about his health and also about his meals (food) at the IIMA hostel. Ahmedabad was quite familiar to our father as he himself had studied Law there. They also met Shri Ashok Purohit who was studying Architecture there at that time. Ashok’s father also used to be a freedom fighter and published a newspaper in Jodhpur. Ashok was quite helpful in introducing Labdhi to Ahmedabad and remained a good friend ever. However, the MBA program turned out to be tougher than what Labdhi and Brij Mohan had anticipated. The main handicaps Labdhi had were the lack of adequate preparation in mathematics and problems with spoken english. Being a graduate in Arts stream from a Hindi-medium program, these were expected. He has described these initial difficulties in a term paper he later wrote. His friend Brij Mohan decided to quit after a semester and returned back to Jodhpur. He later joined the Civil Services(Allied) of the Govt of India. Labdhi worked very hard and finally overcame these initial hurdles and completed his MBA in 1967, placed 5th in the batch and with two job offers. He joined Hindustan Levers Limited (HLL) as a management trainee in July 1967. 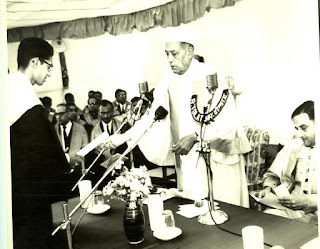 LRB at the IIMA convocation , Ahmedabad, 1967. * Dr. Brahm Swaroop Bhandari is LRB's elder brother and a nuclear physicist who has taught and done research at various universities around the world. He now lives in Jodhpur.